fully handmade in Italy, with great care. The C60 is fully handmade in Italy, with great care – the same care that we’ve used over the last 60 years. 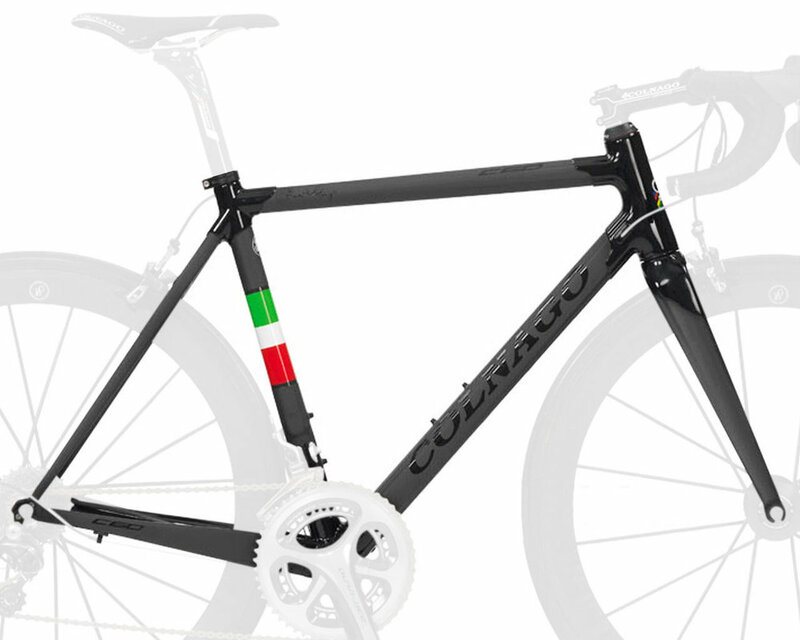 The frame is made of carbon fiber, with star-shaped lugs and tubes – an iconic design element that started with the Master. The sections of the tubes have increased volume with thinner walls. The same concerns the lugs. They are larger and stiffer, designed with the same shape of the tubes. In summary: the C60 tubes and lugs provide greater stiffness and resistance to bending. The rear dropouts have also been completely redesigned, to reduce weight and achieve greater lateral stiffness. Finally, the construction technique used in the C60 offers an unprecedented range of sizes, nine sloping and five horizontal, with custom sizing also an option. The most striking difference between the C59 and C60 is the new tube shapes and its matching shaped lugs. The main tubes are shaped in the famous star design of the Master tubes the full length of the tubes, with no round cross section where the tubes meet the lugs. This is a first for Colnago. Lateral stiffness of the entire front triangle will increase. At the same time, the impacting forces during a rough ride will be better distributed, ensure a higher impact resistance. It may look simple, but achieving the shaping of the head-tube in this way is extremely difficult. Tubes and head tube lugs must be manufactured with paramount precision and tolerance. As a direct result of this technical improvement, the vertical wall found in the C59 was able to be eliminated, further reducing weight while adding comfort. This feature, unique to the C59, was a limiting factor in the design and manufacturing process. The full length star tube on the C60, by comparison, allows better control of the wall thickness and lamination of the entire length of the tube. This is a huge step forward regarding strength, reliability and comfort. The heart of the new C60 is the bottom bracket. The dimensions of this masterpiece, especially when compared to that of the C59, have been created to ensure the ultimate in lateral stiffness. The star-shaped tubing inserts provide more stiffness and a better distribution of stress. This allows for significantly reduced wall thickness. This particular section of the tubing has required a considerable study of the coupling tolerances, to ensure a coupling of tube (male) and lug (female) at the highest precision and tolerances. The system of internal cable routing is now an integral part of bottom bracket junction, forming two structural ribs that add strength to this most critical area of the frame. The second major difference between the C59 and the C60 is the new oversized downtube. The new shape of the bottom bracket allows for the use of a much large tube diameter, thus greatly increasing lateral stiffness. With a square section of approximately 66x52mm (the C59 was only about 44mm) this tube represents the largest tube ever produced by Colnago. This increase leads directly to more efficiency, while at the same time reducing weight without sacrificing comfort. Like the top tube, the star-shaped profile of the downtube runs the full length of the tube as it enters the lug, better distributing negative forces fromthe road surface. This tube profile improves lateral stiffness and efficiency, reduces weight and increases comfort. The C60 does not use a round seat tube in conjunction with star tubes and lug technology. This is another first for Colnago. In favor of a round tube shape, the seat tube becomes strongly asymmetric as it reaches and enters the bottom bracket lug. Due to the space required for the front derailleur, it is not possible to exploit the full width of the bottom bracket shell in the seat tube at this juncture. The solution is to use an asymmetric tube, with a width of 30mm on the left side and 21.5mm on the right half of the tube, for a total width of 51.5mm (for comparison, the seat tube of the C59 is only 34.9 mm). To further maximize lateral stiffness and quick response to handling input preferred by Colnago’s professional racers, as well as more dynamic road performance, the C60 continues to use a 31.6 mm seat post. Despite the dramatic increase in size, the weight of the C60 seattube is actually lower than that of the C59. This is the result of uncompromised design, material and construction methods. Professional cycling races are long and hard. In recent years, the relationship between rider comfort and increased efficiency has become more widely recognized in the cycling industry. Colnago has long understood this: the rider who is less fatigued by road vibration over time is a rider who will maintain maximum levels of performance. This was clearly seen with Colnago’s 5 victories in 6 years in Paris Roubaix, one of the longest and certainly the harshest race on both rider and machine. Colnago’s unwavering commitment to building the most efficient and comfortable race frames can be seen in the C60’s chainstay design. Similar in design to the C60’s front triangle, the tubes used for the chain stays are designed with internal ribs, ensuring optimum lateral stiffness. The comfort in the chainstays is achieved with a tube shape which tapers dramatically towards the dropouts. This provides a slight upward flexion and offers vertical compliance which actively dampens vibrations from the road. This vertical compliance will also act to increase rear wheel traction on rough roads. To ensure more vertical compliance and therefore more rider comfort and less fatigue, the seatstays on the C60 have been designed to work in perfect harmony with the chainstays. The chainstays have a conical profile with tapered diameter and reduced wall thickness. The flat and wide tube profile, especially as it nears the rear dropouts, reduces weight while at the same time providing increased lateral stiffness and vertical compliance. Another new feature introduced with C60 are the forged, CNC-machined one-piece dropouts. With the C60, Colnago has worked hard to make the connection between the frame and the rear wheel a true masterpiece. Colnago has always been proponents of aluminum dropouts for strength and reliability. The new C60 dropouts weigh less than many products made of carbon fiber, but with absolutely incomparable stiffness and strength. The three dimensional design in particular helps the dropout maintain lateral rigidity in even in the most demanding situations. This increased stiffness will help also in the event of a crash – where the newly designed inbound derailleur hanger will more consistently break rather than the dropout itself. Colnago has paid attention to the smallest details on the dropouts, such as the milling on the drive-side dropout to cleanly route the cable of the electronic groupsets with no interference with the quick release lever during wheel changes.